I’ve read a lot of books in 2018 – more than 150 in fact, and I reckon I can manage to squeeze in a few more over the next few weeks before the New Year forces me to start anew – and that’s covered quite a few different subjects and genres. I’ve managed to get my teeth into a few military history books, though not as many as I would have liked, and to my surprise I’ve fallen completely and utterly in love with the Horror genre as a whole, to the extent that it’s a running joke amongst friends and family that my blog’s title – The Scifi and Fantasy Reviewer – is now ever-so slightly misleading, and really needs to be revamped and perhaps even retitled. Well, that’s certainly a possibility, but I can’t and won’t apologise for throwing myself into the Horror genre as a whole, because it’s meant that I’ve discovered a whole raft of publishers and authors that I would otherwise have completely missed out, and accordingly widened my literary horizons and my reading tastes. I’ve come across a lot of fantastically-written and highly imaginative slices of Horror fiction, ranging from body horror, to psychological horror, to the strange, semi-isolated areas of Weird Horror that I find myself burrowing into at this exact moment. But I have to admit that my first love in the genre is, and probably always will be, Cosmic Horror. I first discovered it in the writings of Charlie Stross and the phenomenal Laundry series, and since then I’ve ranged across the subgenre as a whole. I’ve enjoyed reading so many titles, but I’ll always have a preference for those authors who take a slightly different angle to the genre – something pulpy and imaginative, that doesn’t shy away from merging action-adventure with eldritch horrors and many-angled deities. One example would be Matthew Davenport’s The Statement of Andrew Doran series, that features an Indiana Jones-style Professor using occult means to fist-fight Nazis, and another would be the author of the title I’m currently reviewing – John Houlihan’s Feast of the Dead. I’ve been on record before as saying that there is nowhere near enough Cosmic Horror fiction that takes advantage of all of the possibilities to be found in the time period that existed before the year 1900 – it seems like every Cosmic Horror title that comes out now, from major publishers to self-published authors, is set somewhere in the 20th or 21st Century. To be honest, they all seems to blur together at some point, and as a result when I do discover someone who decides to break free of those constraints and write Cosmic Horror in a setting that isn’t within current human memory, I grab their titles with both hands – especially if they’re actually good. John Houlihan is one of those authors, and over the past couple of years I’ve followed his works and found them to be so well-written, creative and enjoyable that I’ve found myself reading and reviewing each one as they’ve come out. Specifically, we’re talking about the series of novellas and novels that Mr Houlihan has written under the Achtung! Cthulhu I.P., an RPG developed by Modiphius Entertainment that’s set during the Second World War and features skirmishes between plucky Allied commandoes and warlocks and the devilishly evil and constantly-scheming minions of the Axis powers. Under The Seraph Chronicles brand, Mr. Houlihan has published several novellas that followed the adventures of the mysterious and possibly immortal Major Seraph, who fought through the North African and Norwegian campaigns to foil various Nazi plots. I found them to be hugely enjoyable pulpy adventures that echoed the old Commando and Warlord comics of my childhood, mixing Lovecraftian horrors with blazing Sten guns and epic sword-fights. The second title in The Seraph Chronicles, The Crystal Void, was actually set in the early 19th Century, in occupied Spain during the Napoleonic conflict, as part of a new spin-off series entitled, appropriately enough, Mon Dieu! Cthulhu. And this is where that reference to pre-20th Century Cosmic Horror comes in – I’d never before encountered anyone who had actually taken the decision to set a Cosmic Horror title in that time period, and particularly during one of the bitterest and hardest-fought campaigns of the entire Napoleonic Period. After all, there was a very good reason why Spain was called The Spanish Ulcer by Napoleon himself, and I feel like there’s a huge amount of untapped potential there for Horror fiction. The Crystal Void was another fantastic publication by Mr. Houlihan, following Major Seraph and the genial, albeit slightly dim, French Hussar Gaston d’Bois as they raced to save the Frenchman’s beloved from the schemes of an evil Portuguese nobleman. The period detail was second-to-none, the writing fantastic, and I was eager to see how it could be followed up. I was therefore overjoyed when I heard that there would be a follow-up to The Crystal Void, and it would actually be a full-length novel this time. 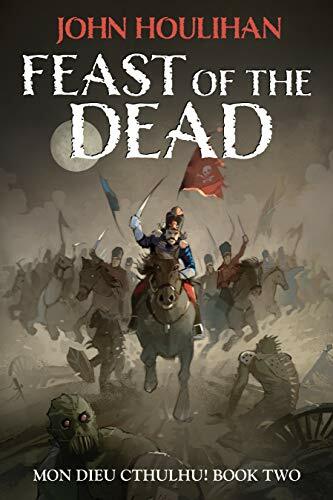 I was lucky enough to be able to see an early review copy of Feast of the Dead, and while a hard-drive crash lost my initial review, the news that the novel had finally been published seemed like an excellent time to revisit and rewrite. I was expecting quite a lot of action scenes in Feast of the Dead, not only because of the time and place that Houlihan set the book in, but also because of the excellent pedigree found in his previous stories. I’d also like to think that I’m fairly hardened to blood and gore given my in-depth immersion to the Horror genre in the last year or so, but even I was given pause by the rapid and chillingly brutal nature of the cavalry action that is described near to the beginning of the book. Houlihan must have done a great deal of research prior to writing the novel, because the scene seemed like something ripped out of a text on the Peninsular War, and reminiscent of many of the memoirs I’ve read of that period. The attention to detail is second to one, and the action is fast-paced, ruthless and over in mere seconds, something that Houlihan quietly and most effectively highlights. It’s a fantastic set-piece to start the novel off with, and I’m happy to report that the action continues in that vein as the plot progresses. The Hussars come across the Monasterio de St Cloud, a mysteriously-deserted ruin in the depths of the Spanish interior, and while they initially consider it as an effective base for raiding into the Allied lines, it rapidly becomes clear that unnatural and inhuman things are taking place. Why are there so few people in the region? What is the nature, and motivations, of the wonderfully-named Docteur Malfeas and his stunning companion Mademoiselle Brockenhurst? And what lurks in and around the ruins, making people disappear? There are some cracking twists and turns as the plot progresses, so I don’t want to really spoil anything in relation to the narrative; suffice to say that it’s highly entertaining, and Houlihan managed to surprise even me with a few especially hair-raising scenes. But a plot would only pull you so far into a narrative if the characters weren’t also engaging, and as always with Mr. Houlihan’s works this is indeed the case. d’Bois himself is still a joy to read along with, his French accent dialled down slightly from The Crystal Void to become merely amusing rather than outright comical; and the author manages to depict a very well-rounded officer, who cares deeply for his men while still managing to hold onto his nerves and investigate the supernatural occurances around the monastery without fleeing for his life. Houlihan has a deft eye for characterisation, and that extends to the rest of the cast – d’Bois’ redoubtable Sergeant Sacleaux, for example, may actually be one of the most grizzled ‘solder’s soldier’ I’ve ever come across in a military story, and his occasional clashes with d’Bois are often quietly amusing. Each character in the narrative are fleshed-out and given their own positive and negative qualities, to the extent that it feels like a truly engaging story despite its often pulp-like nature. That characterisation continues with the nature and motivations of the occult creatures that are encountered by d’Bois and his men as the climax of the novel approaches. As always I want to try and avoid spoilers, but I was again genuinely surprised by how they were depicted by the author. Given the nature of the plot, I was expecting the creatures to have fairly obvious and perhaps even two-dimensional reasons for attacking those in the region; it would have fit with the overarching narrative, after all, and follow the standard tropes of this kind of title. However once again Houlihan’s skill and imagination as a writer is highlighted, as he takes the time establish sincere motivations for why they are active, to the extent that they actually become both realistic in their actions (for a Lovecraftian monster, of course) and even humanised to a degree. Here Houlihan is helping to lead the Cosmic Horror genre in a direction that has been noticed by many authors and reviewers. Author Mary SanGiovanni has been discussing this notion extensively in several podcasts – both The Horror Show with Brian Keene, and her own Cosmic Shenanigans – and it’s a fascinating idea, moving away from the original Lovecraftian notions of supremely inhuman and inscrutable eldritch horrors towards something more understandable and therefore, to me at least, even more horrifying. Feast of the Dead is one of the most accomplished, entertaining and quietly chilling Horror novels that I’ve come across in my dive into the genre, and is certainly Mr. Houlihan’s best work to date. Deftly written, with an eye both for detailed characterisation and some brutally-described cavalry action, especially against the partisans that roam around the Monastery and the surrounding countryside, it’s an epic, swashbuckling Napoleonic adventure expertly blended with chilling Lovecraftian horror, and I can only hope that we will see more from the author and the gallant d’Bois before too long.